This week Cara and I chose close-up as our theme. I wanted a theme that was pretty easy since I am still transitioning back to real life after vacation. 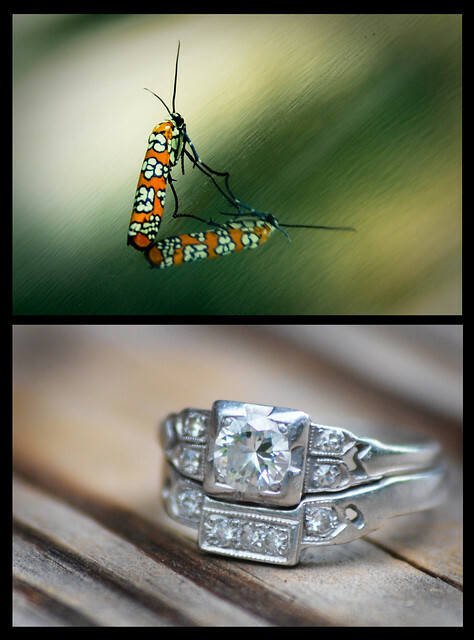 I envisioned a macro shot of a bug or flower when we chose the theme, but then I realized that my 10 year wedding anniversary was going to fall on Thursday (today). So then I changed gears and decided to photograph my wedding ring. The engagement ring is an antique from the 1930's. We had the wedding band made to fit it. I can honestly say that 10 years later, I still love it just as much as the day Mitch proposed. Cara's photo is so intriguing. What a spectacular looking bug and she captured it perfectly. I love the reflection and the background texture. Happy Anniversary Mitch. The last 10 years have been the best years of my life. I am looking forward to many more years of adventures. I love you. Happy Anniversary to you both. I love your shot, the DOF and the details you got. Do you have a macro lens or macro filters? I have a my grandmothers engagement ring from around the same time period and it looks similar to yours. I should take a picture to show you. I love that you got the wedding band made to go with the engagement ring. It's beautiful! You have great taste in jewelry. GREAT MACRO shots - love the clarity on both. Love the orange and black bug - almost looks like flowers all over it's body! PRETTY ring - looks custom!? Great job team. those are beeee-eautiful rings!! classic and lovely.